Rinse the lentils, then cover them with boiling water and let stand while you gather and prepare the rest of your ingredients. Heat the oil in a wide soup pot. Add the onion, give it a stir, and cook for about 5 minutes to soften some. Stir in the cumin, coriander, salt, rice, cilantro, and dill, and cook another 5 minutes or longer, then add the greens. Give them a stir, then drain the lentils and add them, along with 8 cups water or stock. Bring to a boil, then lower the heat, cover the pan, and simmer for 20 minutes or until the lentils are sufficiently soft. If they soaked, it shouldn’t take much longer. Taste the soup for salt, and season with pepper. 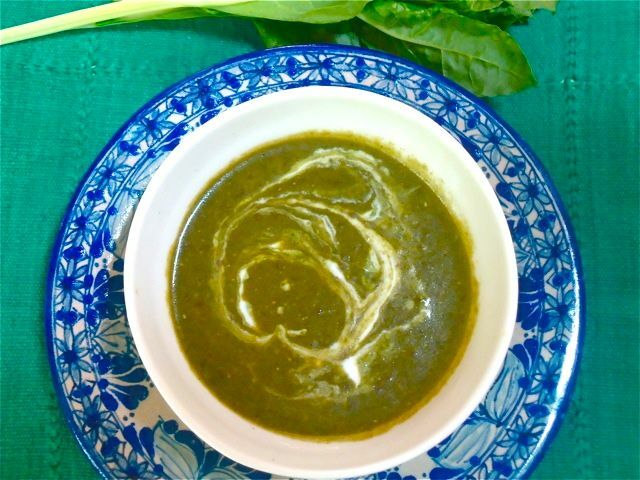 At this point you can serve the soup just as it is with a dollop of yogurt or Sorrel Sauce, or you can purée the soup, ending up with a dark green soup that’s neither too thin nor too thick. Again, stir in the finishing yogurt or sauce or a squeeze of fresh lemon juice into each bowlful. Or if it’s just you, plan to eat this soup all week and feel the better for it. The greens can be almost any, but the goosefoots — chard, spinach, beet greens, and others — are particularly well-represented here. You needn't stick to just one type of green; a mix is more interesting.